Recipe, post, and photos updated Feb 2017. Originally posted Jul 2017. Avocados are my love language. 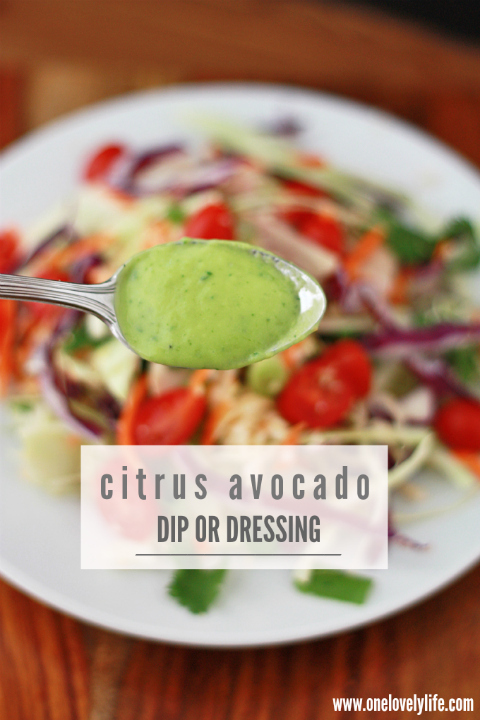 This citrus avocado dressing and dip has been one of my go-tos since I developed the recipe several years ago. 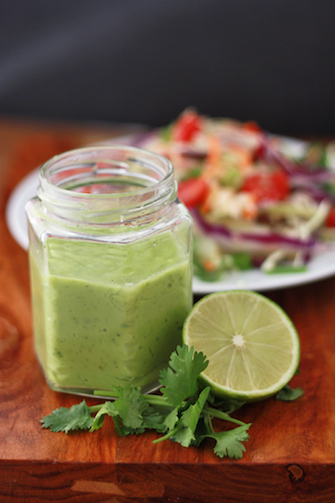 It’s bright, it’s balanced, and it’s fantastic with so many different foods–veggies, chicken zucchini poppers, tacos, burrito bowls, salads, and more! It’s bright, happy, full of flavor, and simply delicious. I love it best as a dip for fresh veggies and turkey or chicken roll ups (turkey wrapped around bell pepper slices, or lettuce, or whatever else makes your heart pitter-pat). 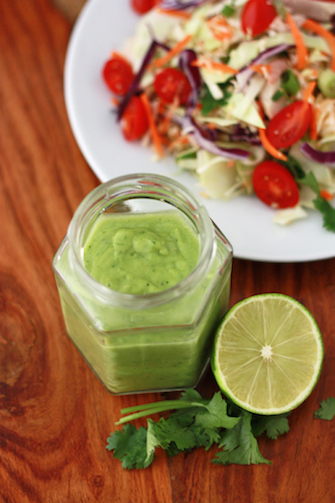 As a salad dressing, it’s DIVINE on anything with a Tex-Mex or tropical vibe. Make a big carnitas salad and add a big dollop on top, drizzle it over fish tacos, serve it with some fresh mango spring rolls or spicy sweet potato fries, or use it to top Jamaican Jerk chicken. See? Versatile! The best part? All that citrusy goodness keeps this from turning brown. It’ll stay vibrantly bright green for 3-4 days (if it lasts that long), and you can even freeze it if you like. All it’ll need is a quick stir and it’ll be ready to go after thawing. 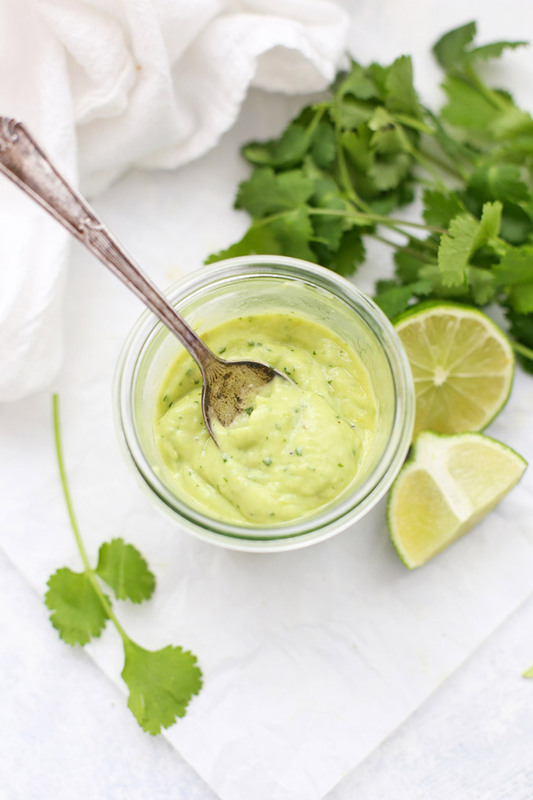 All you have to do is toss the ingredients in a blender or food processor and in a few seconds, you’ll have the dressing you’ll want to put on EVERYTHING! Did you know you can freeze avocados? You can! To freeze ripe avocados, I peel them, remove the pit and place them in a zip-top freezer bag in a single layer. Freeze till firm, then just pull one out when you need it. That way if you bought 5 avocados and they’re ALL ripe on the same day, you don’t have to toss any out. You can also freeze this dip. I like to put it in a zip-top freezer bag and lay it flat in the freezer. When it’s frozen this way (so it’s spread out fairly thin), it will thaw in a snap! Just give it a quick stir to pull it back together, and it’s ready to go! What to serve it on? Anything. With veggies. With my chicken zucchini poppers. In wraps. On sandwiches, burgers, chicken, steak. Over salads. Drizzled on fish tacos. Or beef tacos. Or sweet potato and black bean burritos! 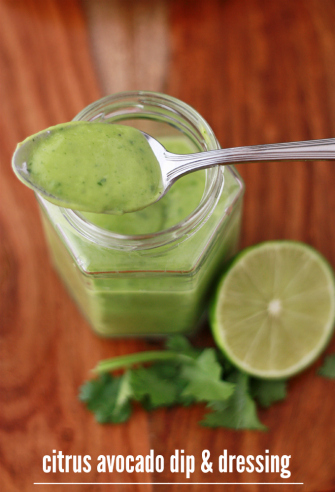 Place all ingredients in a blender or food processor and puree until very smooth. You may have to scrape down the sides a few times, but it should get very smooth, light, and airy. Taste and add additional salt or pepper, as needed. 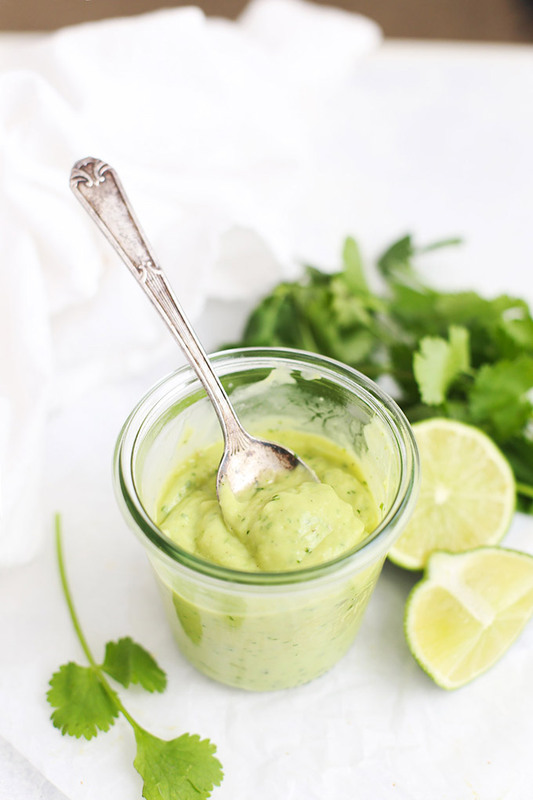 To use as a salad dressing, add 1 tablespoon of water at a time to the dressing and whisk or blend to incorporate well, until you’ve got it as thin as you like. This will keep 3-4 days in the refrigerator, or can be frozen for 1-2 months in an airtight container. To use, simply thaw in your refrigerator or a bowl of cold water. Whisk to bring everything back together and serve cold! Thank you for this!!! I’m excited to try it! Your sister sent me over here to your blog since we have gone dairy and soy free (for baby girl) and my son is peanut and egg allergic. Avocados are a major staple around here! Have you tried avocados on pasta? I blend/process 2 avocados with 2-3 tbs olive oil and you have a yummy sauce for pasta. We add chicken, tomatoes, and other things in the sauce to make it more exciting, but we love it! I am loving your recipes, thanks so much!! Meghan – Yay! Glad to have you here. I LOVE avocado with pasta. I like it with lemon zest + juice + a little basil. Yum! I’ll have to try the olive oil version next time, it sounds great! This sounds so refreshing and versatile, indeed! This looks amazing! We are huge avocado lovers over here, but I’ve never used it like this. When you freeze your avocados, do you freeze them as halves, cut into slices, or how? Thanks for your amazing website! Jillian – I usually just halve the avocados, peel and pit them, then freeze them in halves. Hope that helps! I can’t tell you how thankful I am to hear about freezing avocados! I’m always a victim of them “all going ripe at the same time!” I’m staring 5 ripe avocados in the face right now, actually. Because who can turn away an entire bag from Costco? Amen! This is what’s saved me! 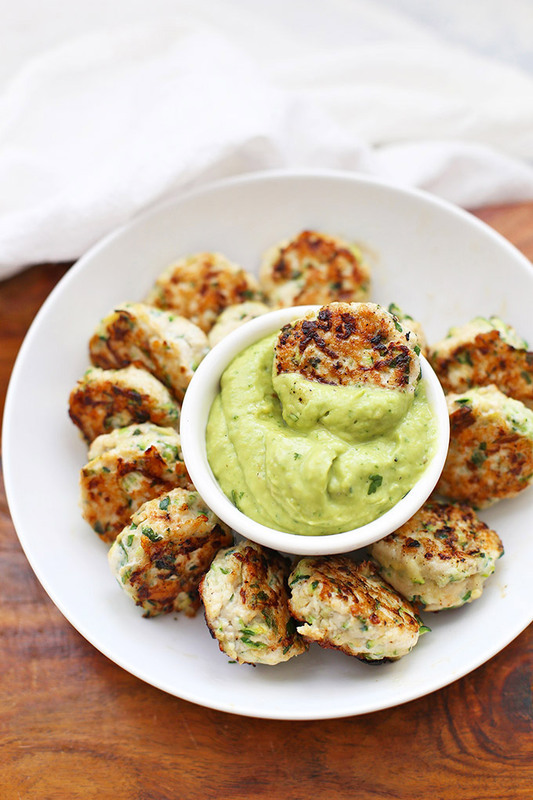 Our family loved this along with the chicken/zucchini bites…even my husband!! Yum! Oh, I’m so glad, Michelle! Oh. My. Gosh. I just made this and it is AMAZING. So creamy. So light. So delicious!! I’m so happy to hear that Kara! That’s great!!! This is absolutely a favorite! Yum!! 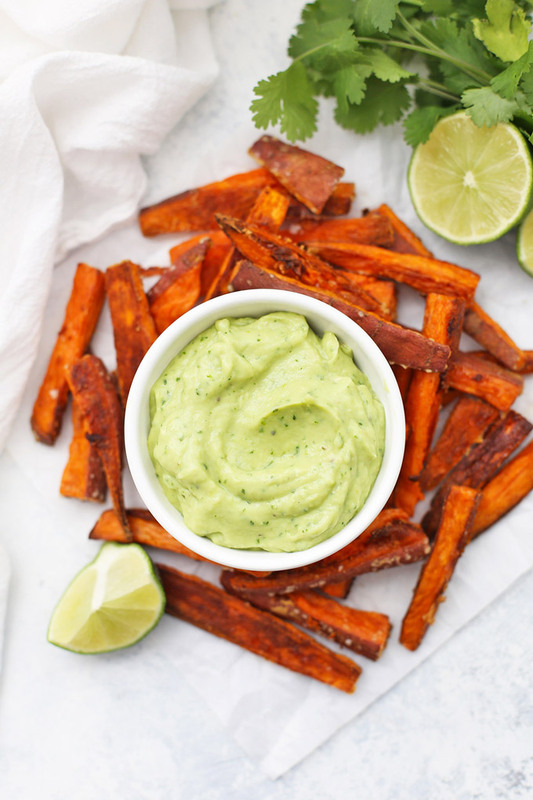 Loved this with sweet potato fries and the chicken zucchini bites! So good! Thanks!! YAY! I’m so glad. We had it for dinner the other night and it made me fall in love all over again! Enjoyed the flavor alone but added cumin and totally YUM! YUM!!! That sounds so good! Totally trying that next time!